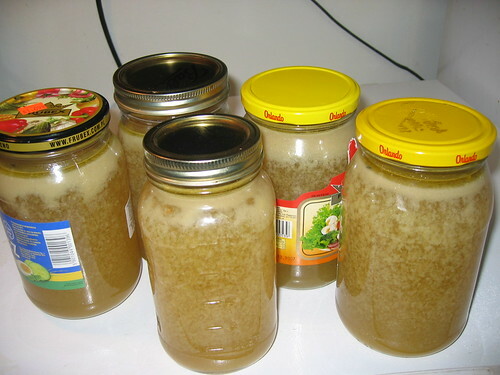 Jars of Chicken Stock ready for freezer. 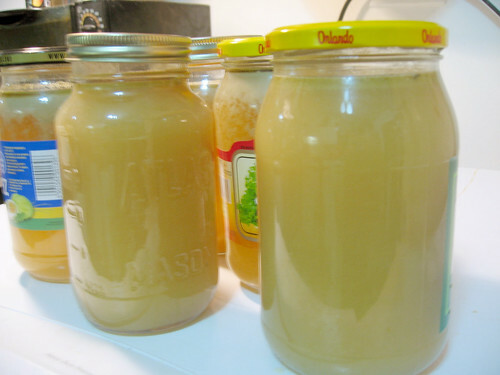 Chicken stock is on the top of my must have kitchen staples list. Its so useful to have on hand when I want to whip up a quick delicious soup, need a base for a sauce or gravy, or just want to give some extra flavor to rice. 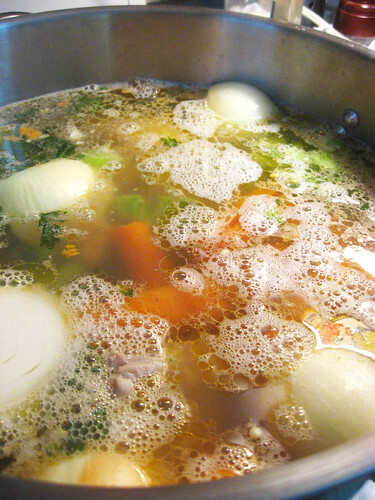 Although making stock is easy, and doesn’t require a lot of work, it does take a bit of time. Because of this, I always make it in huge batches I can freeze for future use. I love making stock because it always makes me feel so old-timey to have a huge pot of stuff cooking on the stove. OK, lets get to the meat of the situation and make our stock. 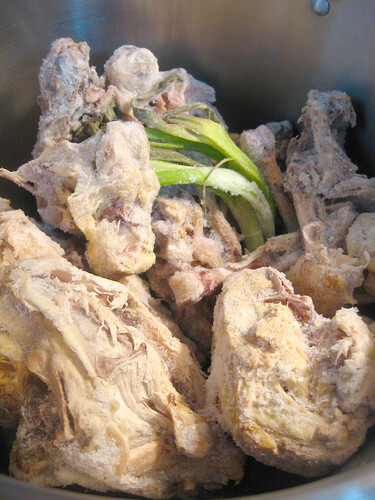 Chicken carcasses saved from previous dinners and frozen until I was ready to use them for my stock. Onions and carrots chopped and ready to go, with parsley from the freezer. 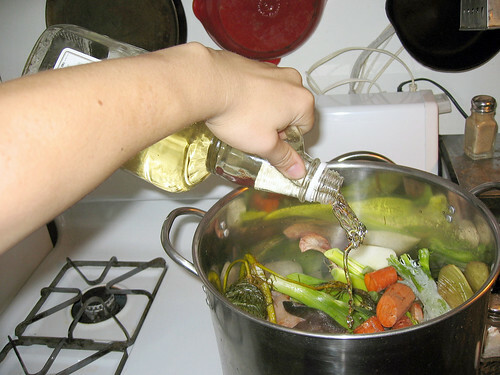 Place all the ingredients in a large stock pot and add water until all the ingredients are just covered. Place on burner set to high. Bring to a boil and then turn burner down to low. 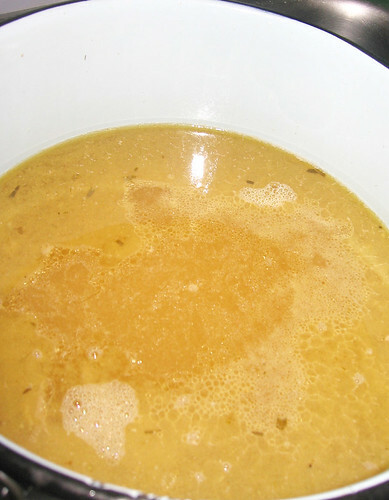 Allow to simmer for a couple hours until the liquid is is a nice broth color. Some only cook their stocks for an hour or two, but I like to let it go for about 4 or 5. I usually make this on a day I want to laze around the house. 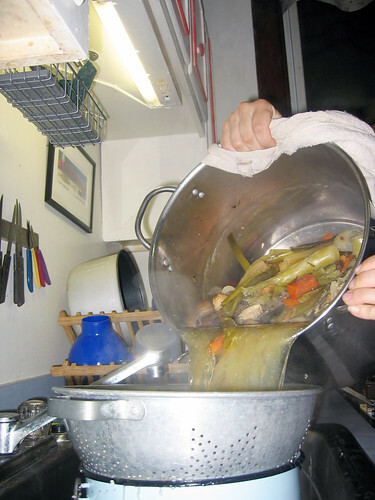 If you taste the broth and it tastes bland, you can strengthen the flavor by reducing the liquid by bringing it to a rapid boil to concentrate the flavor. I don’t worry about having too strong a flavor because this is just a base. 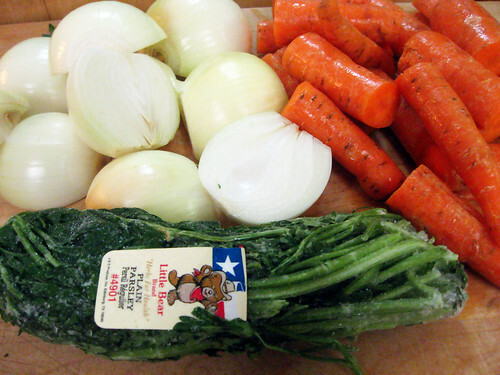 I don’t add salt to my stock, but wait until I am seasoning whatever I use the stock for be it soup or gravy. Water simmering with stock ingredients on left, stock ready to be drained on right. Notice the nice dark color of the completed stock. 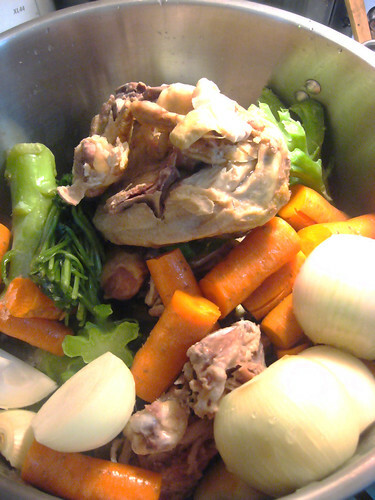 When you feel your stock is done, remove from stove top and using a strainer, drain all the veggies and bones out. Make sure you drain into another pot. I forgot this once! I guess maybe I thought I was straining pasta or something and I stupidly poured all my stock down the drain and was left with a strainer full of garbage. ARG! 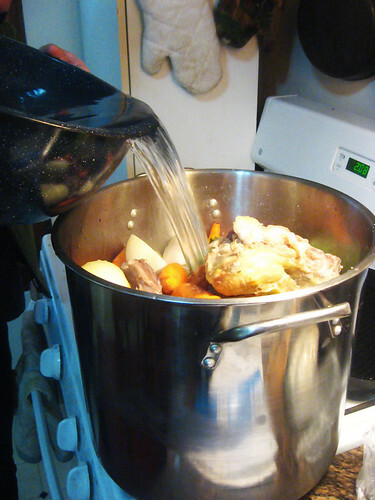 Anyway, make sure you strain it into a pot big enough so you don’t loose any of your precious stock broth. The stock is ready to be put into the freezer. I like using glass jars which I can quickly microwave to defrost whenever I need them. I just save old mayonnaise and pickle jars just for this use.Pour the stock into jars leaving about an inch or so at the top. As the stock freezes it will expand a bit so you want to leave some room in the jar and screw the lids on loose so the jar doesn’t break in the freezer. Check the stock in the freezer the next day and when its totally frozen, screw the lid on tightly and you’re ready to go. Don’t forget to label and date the jar so you don’t forget what it is. You’re ready to go! If you are missing any of the above, don’t worry. Onions are the only truly integral ingredient in my opinion. Even if you only have chicken and onions, you’ll get something good. You don’t need to fuss too much on the recipe. Just go for it. Here are some tips to help you along the way. Look for good sales on chicken legs and thighs (generally the cheapest cuts of meat). I can find them for less then $1 a pound. I’ll pick up a couple pounds to freeze until I am ready to make my stock. 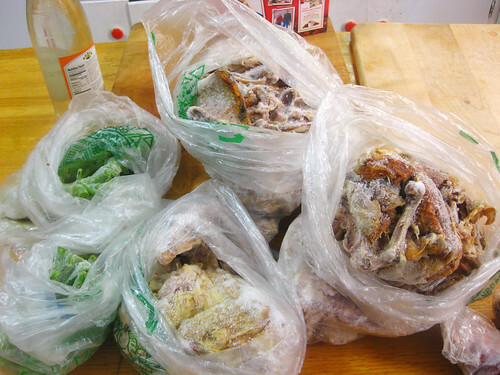 Bags of frozen chicken carcasses and vegetables collected for stock. Save the chicken bones left over from your Sunday dinner, or vegetable cuttings which would otherwise get thrown away to use in your stock. 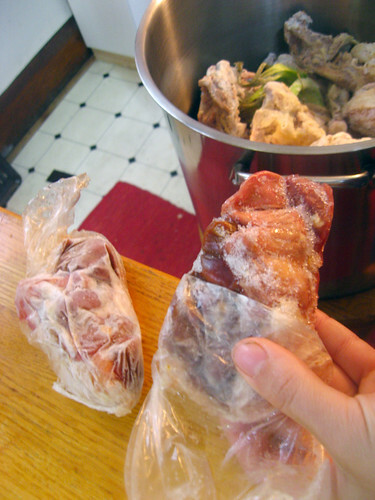 Using plastic bags, place bones, unused meat or vegetable cuttings in the freezer until you’ve collected enough for a big batch of stock. I love being thrifty and making stock always makes me feel like I’m getting something for nothing. 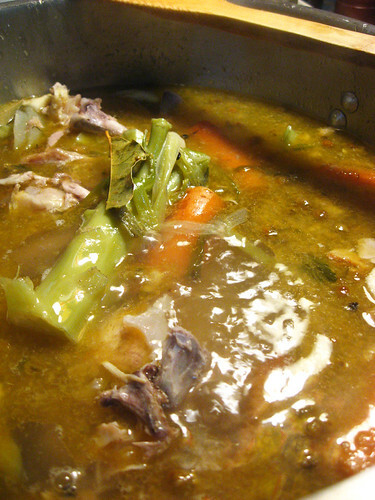 Save the giblets which come with whole chicken for your stock. If have left over parsley or other herbs from a recipe, stick them in the freezer. For stock, it doesn’t matter if the herbs are fresh. Why is the wine in a whiskey bottle you ask? Here’s your answer. White wine is a delicious addition. Stock Up. But What’s Stock?